Forming a party is the fastest way to let you be a solely responsible chivalrous man. It not only makes every player who is in a team level up faster but also has other benefits. It is definitely worth of trying to form a team. Forming a party is very simple; all players need to do just invite other players to join a party by clicking on the right key of the mouse and the function menu will appear, then click on (Invite to the party), if that player choose to join then he/she will be on your party. Only if that player already in a party or in the busy condition then invites to join the party will not be succeeded The maximum number for each party is 6. Every member’s HP and other information will display on the right side of the screen. Everything has its ending so as the party. What can you do if you want to leave a party? It’s very simple. There are 2 ways of leaving a party. The fist one is the captain of the party leave the party and the second one is the member himself/herself leave the party. 1.Captain leaves a party：There are three circumstances.1.leave the party. 2.take out the captain title. 3.dismiss the party. Leave the party: the captain only needs to click on right key of the mouse on his/her name on the party then he/she will be able to choose to leave the team and when the captain leaves the party the next player on the team will fill in as the new captain of the party. Take out the captain title: the captain can appoint another player in the party to be the new captain by clicking on right key of the mouse on that player’s name then choose that player to be the captain then he/she can leave the party as a party member. Dismiss the party: the captain can click on the right key of the mouse on party screen then he/she will see dismiss the party on the option menu. The party will be dismissed if the option is executed. 2.Member leaves a party:：If a member wants to leave a party, he/she can click on the right key of the mouse on his/her name on the party screen and choose leave the party then it’s done. Tracing ability is a distinguishing feature in Huang Yi party system. Every party member or captain can activate this ability by clicking on the right key of the mouse on any member on his/her party then the player will be able to select it from the option menu. Once tracing ability is activated, players in established range will automatically follow their own parties’ members and don’t need to worry that they will get lost again! 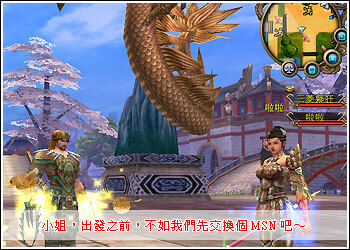 After join a party, players will be able to know where their party members are from looking at the map on the right top corner of the screen. Those players will display in blue dots if they enter the visible area on the map. If players get disconnection from Internet while playing the game, it does not affect their parties’ rights. They will still be the members of their parties; only their names will temporary display in gray and they will return to their original status when they are online. If there are unfavorable players in a party, the captain of the party has the right to banish those players from the party and to do so, the captain can click on the right key of the mouse on the party display and choose banish member.